New Nokia 3310 vs original Nokia 3310: which phone is king? The Nokia 3310 is an iconic handset, and 17 years after it first launched Nokia has brought the handset back to the life in the shape of the new Nokia 3310. But is newer always better? We’ve pitted the new Nokia 3310 against the original to see which one comes out on top. This isn’t just a simple spec shootout though – there’s plenty of nostalgia, emotional attachment and pure gut feeling here too. The new Nokia 3310 price is low... really low. It will go on sale globally some time between April and June for €49 (around $40, £35, AU$55). 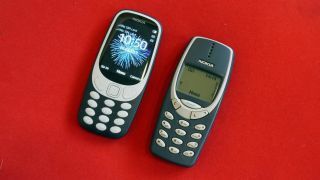 In comparison, the original Nokia 3310 launched at £129.99 (around $160, AU$210), although 17 years later it can be picked up secondhand for a lot less. A quick search on eBay shows multiple hits for 3310 devices, with Buy it Now prices ranging from £15-£50 (around $18-$60, AU$24-80). With a supremely low launch price the new Nokia 3310 is highly affordable, making it a great option as a back-up, festival or holiday phone. While you can pick up the old Nokia 3310 for next to nothing, you can’t guarantee the condition it’ll arrive in, and it doesn’t support many modern SIM cards. The design of the original Nokia 3310 is iconic. Back in 2000 its 113 x 48 x 22mm dimensions were viewed as impressively compact, coming off the back of the taller 3210, and more importantly it could take one hell of a beating. Dubbed by many as ‘indestructible’, the 3310 put solid build quality front and center, with a noticeable thickness and removable fascias, which meant that if you did manage to crack the casing it was cheap and easy to replace. The 133g weight provided a reassurance presence in the hand, without being overbearing, and you could easily use the phone one-handed. Nokia has put the new 3310 on a diet – it tips the scales at 76.9g and measures 115.6 x 51 x 12.8mm, making it a lot more compact and lightweight than its predecessor. While this makes it supremely easily to handle, and almost undetectable in a pocket, it doesn’t feel as solid. You also can’t remove the front cover, only the rear, so swapping out the current fascia for a new one is out of the question. They built them better back in the day. The Nokia 3310 wins this round with its solid, hardy build. It may be thicker and heavier, but it’s still easy to use one-handed and will comfortably nestle in the pocket. Plus, the ability to switch the fascias for funkier options is always fun. Short on time? Check out our new Nokia 3310 vs old Nokia 3310 video below. What makes a good screen? Is it the size, the resolution, the colors, the viewability in bright light? It's somewhat of a mixed bag on both the old and the new Nokia 3310. The original 3310 packs a monochrome display with an 84 x 48 resolution that's laughably low-res in today’s world. That said, it consumed very little power, and was still perfectly readable even in direct sunlight. Things have been stepped up a notch on the new Nokia 3310, with a 2.4-inch full color display adorning the front of the phone. A 240 x 320 resolution gives a more detailed look to the interface, but it’s still nowhere near as good as the displays you get on even entry-level Android smartphones. It’s still power-efficient however, and while Nokia claims a polarizing layer will help with viewability in bright light we’re not convinced it’ll be as good as the original 3310. A higher resolution, bigger screen and larger display all play their part in giving the new Nokia 3310 the win here. The extra detail makes texts and images easier on the eye, although we do miss the green glow of the original 3310's display. The original Nokia 3310 is fondly remembered for its days of battery life. The handset featured a 900mAh power pack which could give up to 2.5 hours of talktime and up to 11 days of standby, making it a bit of a road warrior. Things get even better with the new Nokia 3310 though, with a larger 1,200mAh battery giving you 22 hours of talktime and up to a whopping 31 days of standby. The battery life on the original Nokia 3310 was great, but the quoted stats for the new Nokia 3310 are simply fantastic. We’re yet to put the new 3310 to the test to see if it can live up to the claims, but the early signs are positive. Pick up an original Nokia 3310, hit the menu button and use the arrows keys on the right and you’ll scroll through a familiar list of options. It’s simple yet effective, giving you access to call logs, contacts, messages, games, calculator, settings and… not a lot else. The menu on the new Nokia 3310 isn’t exactly feature-packed, but it has a number of additional options over its predecessor. There’s a calendar, basic web browser, a simple app store and a camera application to name a few. It runs the Nokia Series 30+ operating system, which is navigated via the directional key below the screen. It’s all very intuitive. In this case, more is more. The additional features on the Nokia 3310, along with the updated UI, make for a strong yet straightforward experience. This is a quick section. The old Nokia 3310 doesn’t have a camera. Why? Because it was around before cameras were being put into phones. The new Nokia 3310 does have a camera – but don’t get too excited. The rear-mounted 2MP snapper features a digital zoom and single LED flash – but that’s your lot. For the odd snap it’s fine, but it’s not going to be your main camera. Well it’s obvious: only the new 3310 has a camera, so there’s only one winner here… unless you hate cameras, in which case the original 3310 is your champion. When it comes to connectivity the old Nokia 3310 is very limited. There’s no Wi-Fi, Bluetooth, GPS, microSD slot, USB port or NFC. All you get is basic cellular connectivity. It was a simpler time back in 2000. While the new Nokia 3310 adds a few extras – namely Bluetooth, a microSD slot and a microUSB port – it still misses options such as Wi-Fi, GPS and NFC. You get a slightly better cellular connection – 2.5G to be exact – but that’s only enough to give you a very basic web experience. Just… there’s not a lot in this one, with neither handset packing Wi-Fi, GPS or NFC. But the new 3310 edges it with 2.5G connectivity and the inclusion of Bluetooth. The old Nokia 3310 is sometimes mistaken for a handset which came with the original version of Snake, but in fact it ran Snake II. The second generation of the popular mobile game added a few new levels, a head to your snake and bugs for bonus points. It’s simple, yet utterly addictive – and even today you can spend longer than you’d probably like to admit trying to get a new high score. The new Nokia 3310 has a modern-day take on the game called Snake Xenzia. It have full color graphics, a wider selection of levels, a more lifelike snake and a simpler way to control it – just use the 4 and 6 number keys. It's still fun to play, but lacks the simple charm of Snake II. You can’t beat a bit of classic Snake II action. It's as simple as at. Da da der der, da da der der, da da der der der. It’s a ringtone which is synonymous with Nokia, and both handsets have the ‘Nokia tone’ as a ringtone in their settings menu. The original Nokia 3310 has the classic monophonic jingle, which always raises a smile when it’s played. The new Nokia 3310 has a more polyphonic variant of the tune which makes it a little fancier. It’s a matter of taste as to which you’ll prefer, but purists will always opt for the monophonic version. As with any classic song, remixes are all well and good, but the original is always the best. If you tot up the totals, the new Nokia 3310 wins this shoot-out with a score of 6 category wins to 3 – but that doesn't tell the whole story. The new Nokia 3310 doesn't offer the nostalgia, the twang of sentiment you get when you think back and remember the original 3310. For some it can never be bettered, and the reboot won't hit the same heights. We'd have liked to have seen the design follow the original a little more closely, but the addition of the new features, improved battery life and color display means the new Nokia 3310 is a worthy winner. MWC (Mobile World Congress) is the world's largest exhibition for the mobile industry, stuffed full of the newest phones, tablets, wearables and more. TechRadar is reporting live from Barcelona all week to bring you the very latest from the show floor. Head to our dedicated MWC 2017 hub to see all the new releases, along with TechRadar's world-class analysis and buying advice about your next phone.